Kneesavers Pedal Adaptors are stainless steel extensions which relocate each pedal an additional 20, 25 or 30mm away from the crankarm. Developed by physical therapist Randy Ice P.T., C.C.S., Kneesavers help eliminate foot ankle knee or hip pain for those cyclists with a toe out condition as well as improve biomechanics in those cyclists with wide hips, large feet, or bowlegged/knock-kneed leg structure. In his practice evaluating and treating cyclists with cycling related pain, Randy Ice recognised the design limitations of current fixed and free floating pedal and crankarm systems. These systems limit toe-out to approximately 3-5 degrees before heel contact is made with the crankarm and / or chainstay. By installing Kneesavers, the degree of toe-out can be increased up to 35-40 degrees, distancing the pedals further apart improves the bio mechanics of cyclists with the above mentioned conditions, thereby improving pedaling efficiency and power for both competitive and recreational cyclists. Foot, ankle, knee or hip pain is relieved! I bought a pair of the Jtek Q Pedal Extenders for my wife to use on the back of our tandem a few years back. She found she had no knee pain on the very first ride using them. We acquired a new tandem and on the first ride out with no extenders she experienced knee pain again so I bought her a set of these as there is no need to remember to wipe with a little oil after each clean to prevent rust. I didn't realise how much I truly needed these kneesavers till I installed them and then went on a ride. It felt like I could put more power down and pedalling in general was just more natural and comfortable. As I will be getting another bike in a few months time, I will have to order another set. This is a great purchase as I have toe out on my right foot, and cycling was very uncomfortable with shoes locked on to pedals, not to mention the extra stress on my knee. I do think they are over priced as they are only a piece of stainless bar cut to length and threaded, but alternative solutions to pedal position are almost non existent. I have been using these adaptors for a few months now and they have improved my cycling action completely. my ankle used to brush the crank at the axle but it no longer happens. It took a bit of time getting used to the position of the pedal but now I can locate the pedal easily now. Very easy to assemble so I can't recommend enough if you have any issues with your pedaling action. ProsAllows me to cycle long distances pain-free. This has completely transformed my cycling experience. I have a very toe-out stance the only way I could ride a bike comfortably was to basically have my left foot hanging over the side of a flat pedal, causing foot pain after 20 miles, or to force my foot to stay on the pedal properly, causing knee pain. With this, these problems are a thing of the past. Quite expensive for what it actually is but it they are beautifully machined and worth their weight in gold if you have feet alignment problems. ProsEasy to fit. The difference between being able to cycle properly or not. This is a repeat purchase for me, so pleased am I with my previous one. A road accident in 2001 left me with a right foot turned out by 25 degrees. This means that my right heel catches the crank on my right pedal, or I twist my hip to compensate. The kneesaver sorts this problem and allows me to cycle like I did in the old days. And why a repeat purchase? Because I suddenly realised that if my bike gets stolen the greatest loss will be this little gadget: so a spare! CAN I USE THIS WITH A CARBON CRANK? We would recommend contacting the manufacturer of your cranks, we have never tried these in a set of carbon cranks and the longer lengths add leverage that may not be recommended with carbon cranks. Is The Weight Per Single Or Pair? The weight is for the pair. The Kneesavers are made from Stainless steel where as the Jtek are made from basic Cr-Mo steel. The Kneesavers are lighter across the board with the 20mm option 13grams lighter, the 25mm option 8grams lighter and the 30mm option 3grams lighter. Hi, will these fit onto shimano SPD pedals? These use the same thread so will be fine for use with Shimano SPD pedals. You are correct, the length is just for the length of spacer and it does not include the length of the thread. I have been getting pain in my outer knee. Cleat adjustment causes my heel to clip the chain stay. How do I know which length extender to go for? There is no chart for selecting a particular length, you just need to select a suitable length based on how wide you need your foot to sit so when its at the desired angle it does not contact the crank arm. These will fit on to the pedals of a modern road bike? Two year old Trek. Yes they will fit. They are 9/16 thread. 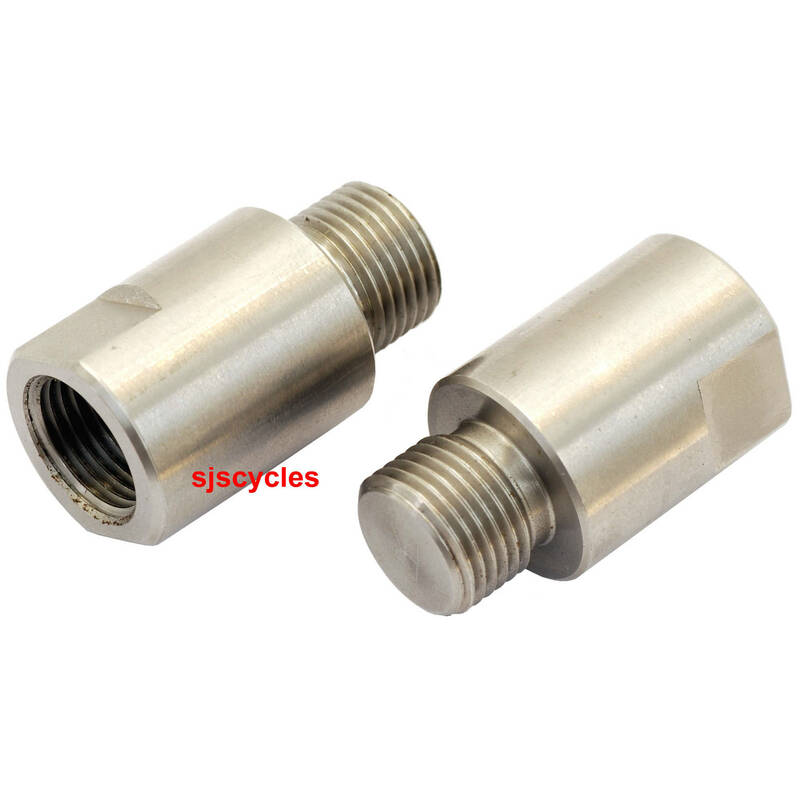 These Kneesavers pedal adaptors are indeed 9/16" threaded.